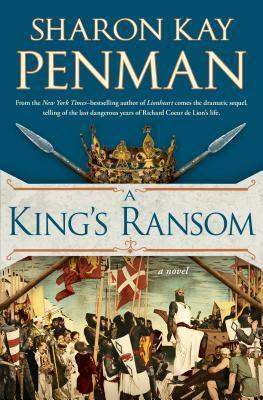 A King’s Ransom is a beautifully written and researched novel about the last years of King Richard the Lionheart and the many, many interweaving stories of family members and alliances throughout Europe and the Middle East. We follow Richard from his pilgrimage to the Holy Land, all the way to the grave. We follow his Mother, Queen Eleanor in her latest years. We learn about nephews, cousins, brothers and illegitimate children. We also get to know Richard’s bride, Berengaria of Navarre. All the wheeling and dealing that goes on to secure land, loyalty and power is brought to the forefront; and it is overshadowed by nothing, except maybe a barren wife. My favorite plot line of this book was most definitely that of Joanna, the sister of King Richard. I found myself wanting her to come back into the story when she was not part of the scene. I was rooting for her, excited for her, crying for her, and happy for her. I was completely invested in where her life was being led. This was partially due to her life having many ups and downs, but also because the was in which it was written was enthralling to me. Usually when I read historical fiction about royal figures, I am left thinking that I don’t know why the women put up with the ridiculous crap men drag them through without it seeming to bother them; at least not in the same way it bothers me. However, I found A King’s Ransom to be quite a bit more satisfying in this regard, because Sharon Kay Penman reached inside the minds of some of the women in this story, and sprawled their thoughts out in the open for us. The wife of the German King “did not show her surprise, she’d long ago learned to hide her true feelings from this man. ’You are always welcome in my bed, my lord husband,’ she murmured, giving him a smile as meaningless as the life she lead.” As meaningless as the life she led. Those seven words put it all in perspective for me. This woman can clearly see that she is leading a lesser life than she would have chosen. She is not blind, she is not in denial, she knows she is being treated poorly. Somehow, this helps to alleviate my frustration with the women of the 12the Century. They knew. But they had no choice. And SKP chose to let us in on the secret. In historical times, it seems the BIble is routinely twisted and misinterpreted as well. I know the Bible is still misread even now, but I feel like it was on a larger scale in the time when everyone believed in God. In the last years of Lionheart, Ms. Penman points out to us that the people were aware of the hypocrisy of the powerful men who imposed the teachings and rulings onto the rest of society. But again, what could a man who was not clergy or royalty do? What could a woman, or even a queen, do to push back? Nothing,if they valued their life. 1. King Richard’s bride herself pondered about how “she’d been taught from the cradle that wives were to be dutiful and deferential. Did scriptures not say that they should submit themselves to their husbands as unto the Lord?” Well yes, scripture does say that a wive should submit herself to her husband. But that isn’t the end of the story. The Bible goes on to say (immediately afterwards), that the husband is to love his wife as he loves the Lord. Which is actually pretty much saying he also should submit to his wife, just as he should submit to the Lord. 2. Richard’s sister Joanna wondered why “the church taught that the Lord Christ’s blood led to salvation, but why then was woman’s blood seen as polluting.” Women could not attend church for six weeks after birthing a baby because they were said to be unclean. How could this be so if Christ’s blood was the atonement, the cleansing, of sin? Of course, it does not make sense, it is just another way men demeaned women in these times. And A King’s Ransom raises the question for us. In the end, reading this book served to remind me just how different life was a millennium ago. It opened my eyes to why woman had to lie in so long during pregnancy. It reiterated that in the realm of the royal courts, marriage was a tool used for power, and almost never for love. I thoroughly enjoyed this book, and did so more and more as the pages turned. This entry was posted in Muse Reviews and tagged Bible, book recommendations, Book Review, Historical fiction, King Richard, King Richard the Lionheart, Lionheart, muse reviews, Queen Eleanor, reading, Sharon Kay Penman. Bookmark the permalink.